Long range weather forecasting is challenging. All of us would like to know what to expect several months out, to help plan your farm management. To help with this, weather scientists utilize the ENSO phases, determined by sea surface temperatures in the Pacific Ocean, to make predictions. 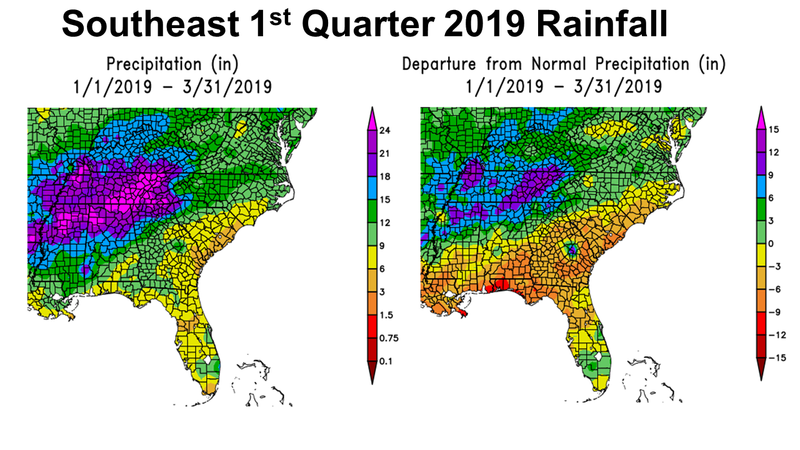 The first quarter of 2019 was foretasted as a weak El Niño, which was expected to encourage above average rainfall in the Southeast, which happened, but not in Florida. While we did see well above average rainfall at the end of 2018, through the first quarter of 2019 the rains shifted more to the north. In the maps above you can see where well above average rainfall fell North Alabama, North Georgia, and East Tennessee. Source: High Plains Regional Climate Center. 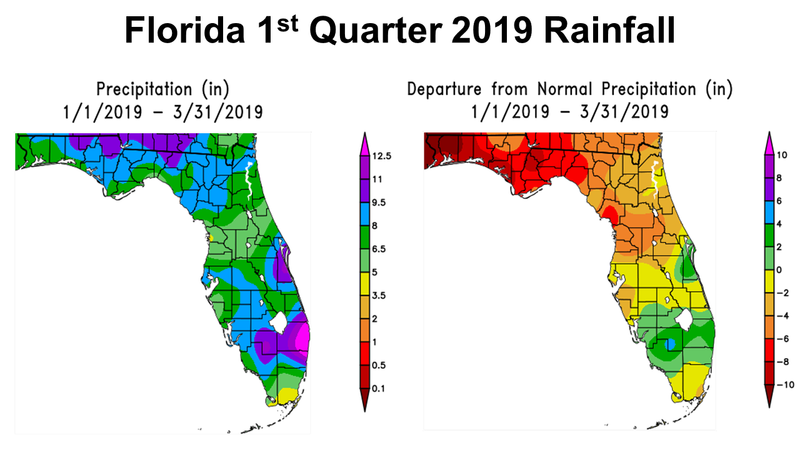 As you can see in the map above the Panhandle, Northeast Florida, and Central Florida received well below average rainfall through he first quarter of 2019. Jackson, Holmes, and part of Jefferson received more than 9.5″ from January through March (purple), while other areas of the Panhandle ranged from 8-9.5″ (blue) or 6.5-8″ (dark green). When you compare this to the historic average for these areas, the Panhandle was 4-10″ below normal. 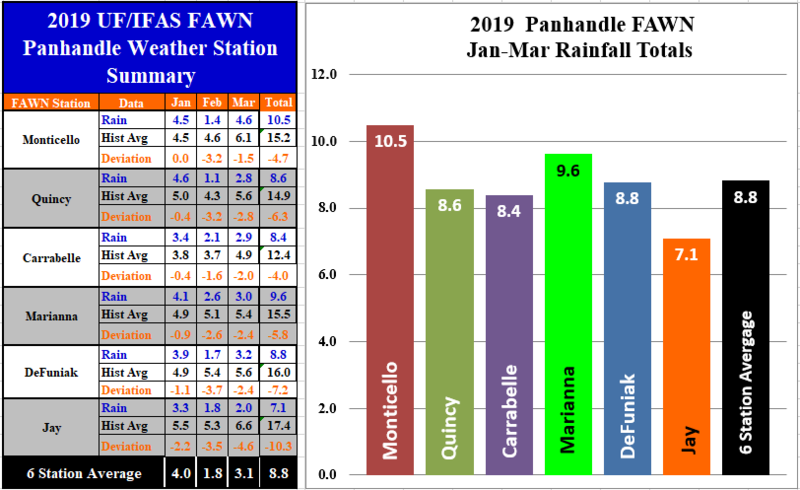 The Florida Automated Weather Network (FAWN) station data provides more precise measurements, and also shows the rainfall deficit in the Panhandle. Through the first three months of 2019, the wettest location was in Monticello with 10.5″, which was 4.7″ below historic average. The driest location was in Jay with only 7.1″ of rainfall, 10.3″ below normal. The average for all six FAWN stations in the Panhandle was 8.8″, which is 6.4″ below average. Normal rainfall for this region is 15.2″ (Jan-4.8″, Feb-4.7″, March-5.7″). So yes, El Niño may have influenced above average rainfall for parts of the Southeast, it was clearly not the case in the Florida Panhandle. 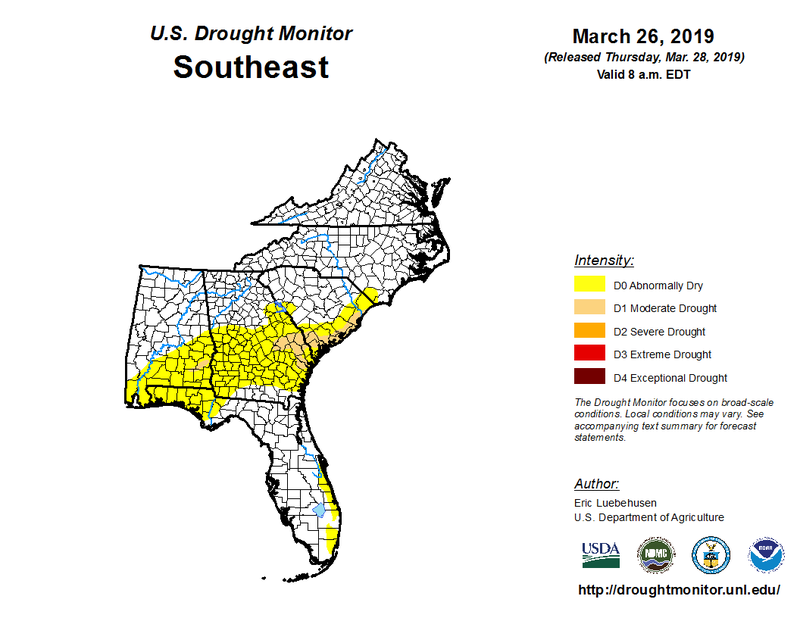 This extended period of below average rainfall has shifted the Florida Panhandle into the Abnormally Dry (D0) category of the US Drought monitor. Much of the Panhandle was sopping wet at the end of December, and has dried out very quickly. Mainly because the heavy rains from fronts that came through during this period shifted considerably northward. 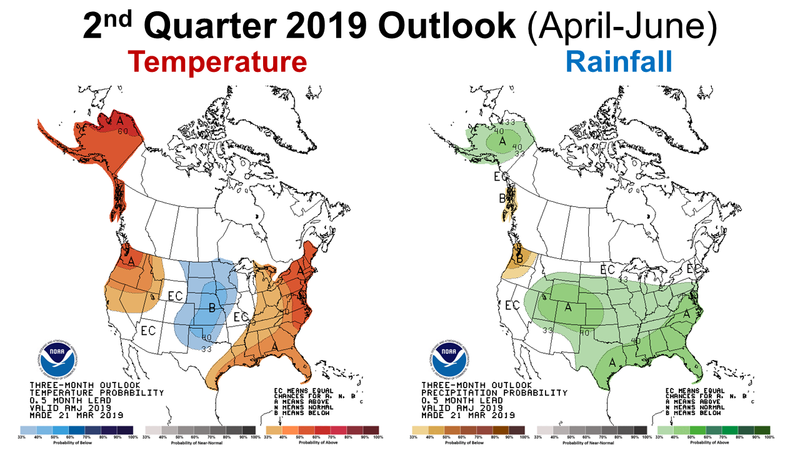 The Climate Prediction Center (CPC) forecast for the first quarter of 2019 predicted normal temperatures. The chart above shows daily high and low temperatures from the Marianna FAWN Station. 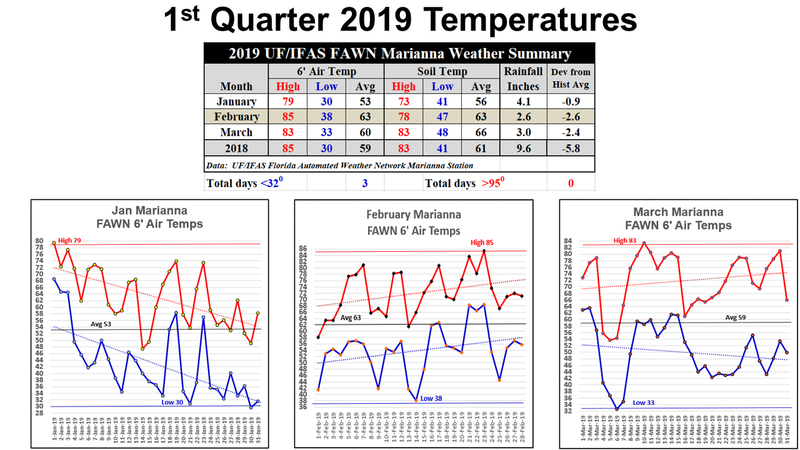 You can see that temperatures were well above average through the first quarter of 2019, with only 3 days below freezing in January. Looking at the dotted trend lines, you can see that temperatures cooled through the month of January, warmed up significantly in February, the then cooled off slightly in March. Average 6′ air temperatures were 53° in January, 63° in February, and 59° in March. 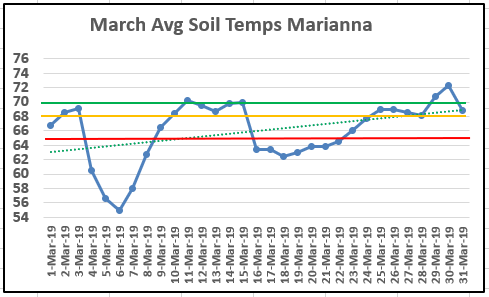 Looking at soil temperatures in March, you can see that after March 6, the average soil temperature rose fairly rapidly. The red line at 65° represents the minimum temperature for peanut and cotton seed germination, with the yellow line at 68° is the minimum recommended temperature for planting these crops, and the green line at 70° is the ideal temperature for seed germination. As you can see, the soil was approaching the ideal temperature for crop planting already at month’s end. Knowing the recent variation from the previous 3 month outlook, it is really hard to know what to expect as farmers and ranchers prepare for planting season. The Climate Prediction Center (CPC) is forecasting a 40% chance of above average temperatures and rainfall from April through June. Much of this outlook is influenced by the most current weak El Niño ENSO phase report. El Niño conditions are present. Equatorial sea surface temperatures (SSTs) are above average across most of the Pacific Ocean.The pattern of anomalous convection and winds are consistent with El Niño. Weak El Nino conditions are likely to continue through the Northern Hemisphere spring 2019 (~80% chance) and summer (~60% chance). So what should farmers and ranchers expect? Let’s hope that the forecast is correct for this area. If it is, then there should be adequate soil moisture for planting in the coming months. However, if you are planting without irrigation, I would sure wait for conditions to improve. Certainly the rains that came through on April 4th and 5th are a start in the right direction. I have a phrase I use when discussing planting dates with producers that is very fitting this year, “IF IT IS DRY AS A BONE, POSTPONE!” I know once area farmers start planting, they have to keep going to get crops in the ground in a timely manner. But, if you are just planting one crop field, pasture, or hay field, and have some control over timing, I would sure wait until you have adequate moisture and a good chance of rain in the forecast before planting.